Camp Barnabas registration is coming up soon! If you don't know what Camp Barnabas is, it's a camp that we attend during the summer where students get the opportunity to serve others with disabilities. From personal experience it's an exhausting week, but incredibly fruitful. The students get paired with a camper who will be their buddy the entire week. It really teaches the ability to serve even when we are put in challenging situations and to persevere. One of my favorite parts is that you are assigned a team to serve together. It's amazing to be on a team with people who have the same mission. You really get to rely on them and build each other up. Although it was exhausting you really got to experience God as you truly have to rely on His strength and not your own. I would highly recommend this camp to students who are eligible to attend. It truly is a life changing experience. Registration will need to be submitted by February 1st along with $55 per student. Only students who are 14 (13 entering 9th grade counts) or older this next year are able to attend. The dates for the camp are June 1st-7th. If you have any further questions don't hesitate to ask. NTS Camp dates are official! Make sure to place this on your calendar so your students are ready for an amazing week this summer! Camp is a week where students learn about God, compete, and spend time continuing to develop friendships. It’s a true bonding experience! 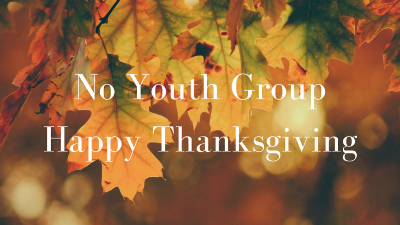 No Youth Group November 21st due to Thanksgiving! Have a lovely time with your family! Christmas party takes place December 12th from 6:30-8:30pm! Bring a white elephant gift $10-$15 and under to exchange.